First of all what we need to talk about is DDR, DDR is double data rate which is what all memory is now. 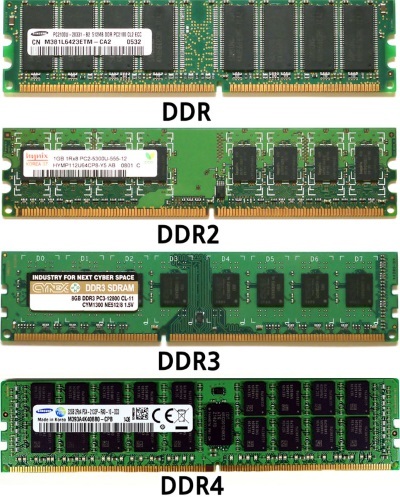 Since DDR came out it's gone through a few generations DDR, DDR2, DDR3 and now DDR4. These different generations of memory have different speeds as the peak transfer rate rose through the technology. With each new generation we have differences in the keyhole, which is a slot to ensure the correct memory module is being used. Memory from the wrong generations can't be used in machines which don't support it, and having the keyslot ensures the wrong modules aren't inserted. Other variations on Server memory are unbuffered, fully buffered, or registered. Many servers can use only unbuffered, or only registered, or only fully buffered memory. The difference is how the memory reacts to the information it's given. Unbuffered memory doesn't generally have error checking and correcting, and is therefore not ECC. While fully buffered, and registered memory include error checking and correcting. Along with the error checking and correcting registered and fully buffered memory have an extra chip. This chip communicates with the CPU directly and then distributes the information to be processed acrost the memory modules other chips. With unbuffered memory the CPU has to send the information to each individual chip on the memory module. This means an increased load on the CPU when using unbuffered memory vs registered or fully buffered. Fully buffered is only widely used with DDR2 as DDR3 moved away from it and became only registered or unbuffered. Find out more about server memory from Cloud Ninjas or use their unique selection tools to find the correct types of memory for your machine.